Not the Dummy we expected! ﻿ I skipped past this film so many times, having lived the last three years of its life on my shelf but when I eventually did decide to watch it I was pleasantly surprised. As with most cinema failures, it soon found its way into bargain bins everywhere and generally forgotten by the public. As my experience has taught me, you can't take the word of a few film critics as gospel. Despite this early set back, DVD sales fared somewhat better, finally bringing this little gem to a wider audience. A lot of people would immediately see the proud banner splashed across the top of the DVD case and assume that because James Wan, who Wrote, Produced and Directed the original Saw film that they would be in for the same dark, dingy shock horror film that saw Cary Elwes ultimately hacking off his own foot in a last ditch effort to escape a prison in which he had awoken some hours earlier. This film is far from the shock gore fest that saw Wan gain a certain level of Hollywood kudos and intentionally or not, gave birth to a new genre of Horror. This is back to basics and a solid, if somewhat safe, storyline in which a murdered ventriloquist returns from the grave to seek vengeance on the ones who were involved. The film has some pedigree in the casting department, with True Blood's Ryan Kwanten as a young widower looking for answers and from the Saw franchise itself, Donnie Wahlberg, playing a sarcastic cop who has already singled out Kwanten's character as his number one suspect. Dead Silence, as with most films in this genre, has it cringe worthy moments and by no stretch of the imagination is this film going to work its way into the top 100 greatest horror films anytime soon but for anyone, like me, who enjoys watching horror films with no commitment to invest too much time and effort, this is one film to watch. 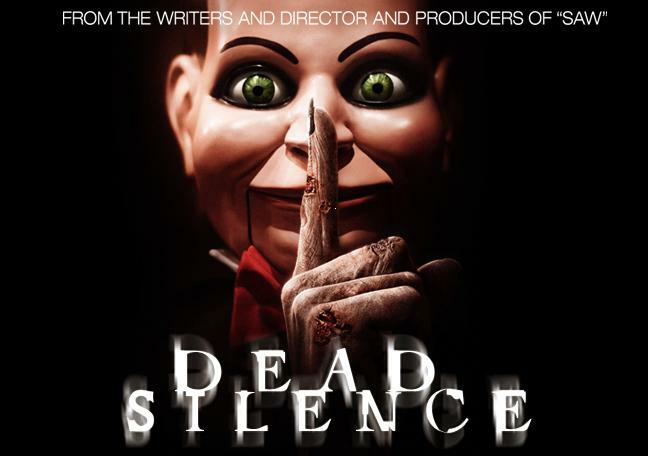 An entertaining little horror with some creepy looking ventriloquist dummy's and a good atmosphere. Look out for the Billy "Saw" Puppet too, a great little touch from the director, giving a small personal touch for those who spot and recognise the addition.